The red arrows I have placed along the x-axis mark the dates of presumed ransom payments to hostage-takers. The exact dates and episodes are given below. The figures in parentheses represent either the reported amount(s) of a ransom payment or an amount demanded by the hostage-takers prior to release. The governments of the states involved (Italy, France, Romania, and the Philippines) have, of course, typically denied paying ransom or refused to comment. 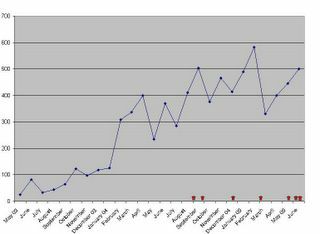 Note that the spike in civilian deaths in April 2004 is presumably linked to the siege of Fallujah and that in June 2004 to heightened terrorist activity aimed at disrupting the transfer of sovereignty. If one corrects for these two anomalies, the correlation between civilian casualties in Iraq and ransom payment would be more striking. One wonders if the Malbrunot and Chesnot release in late December - celebrated in France as a "Christmas present" - did not in fact serve to finance the wave of terrorist attacks that accompanied the Iraqi elections the following January. "Follow-Up: The Release of Florence Aubenas"
"Oops! She (Florence Aubenas) Did it Again..."
I have added a seventh red arrow to the x-axis to mark the June 22 release of the Filipino hostage Roberto Tarongoy. Again, my thanks to Michelle Malkin for bringing this case to my attention. It has been my general methodology here to presume the payment of ransom in the absence of any political demands being met - or, of course, if the payer has confirmed such payment (as in the KGL episode). This is just to apply Occam's Razor. Any other assumption - such as, "the jihadis had a change of heart" - is more complicated, more arbitrary and less plausible. In the Tarongoy case, the kidnappers demanded ransom, so one can presume they eventually received ransom. Shortly before the release of Tarongoy, they also apparently put forward a political demand: namely, that the Philipinnes should assure that no Filipino citizens travel to Iraq. But inasmuch as such a ban was formally already in place - Tarongoy had himself violated it in entering Iraq - the hostage-takers presumably agreed to make such a demand in order to provide some margin of deniability for the Arroyo government regarding a ransom payment. Others who know more about this case than I are most welcome to add comments or drop me a line at jrgencer-AT-yahoo.com. Nazi War Crimes: Protecting the Perpetrators?